For most firms, human capital represents one of their largest investments and presents one of the most difficult resource management challenges. How can a company maximize its return on human capital investments? People Equity can be a powerful framework for examining investments in human capital and for determining their impact on customer and shareholder value. The value the market places on an organization — and affords to its shareholders — is based on a number of different factors. The consistency of past earnings, revenue growth and earnings are all important. But, there are also intangible factors related to the current and future earning potential of an organization that investors consider in fixing its value, such as new patents, brand equity and the firms existing customer base – to name just few. The marketplace also evaluates the human capital of an organization. For example, the 50% premium price/earnings multiple that the market has given to Southwest Airlines compared to its competitors is based to a large degree on the company’s quality of its leadership, commitment of its employees and the long history of positive labor relationships the company has experienced. If any of these human factors were threatened the value the marketplace gives the company would quickly decline. People Equity, then, is the value shareholders gain from the human capital invested in their business. This includes the premium (or penalty) a company receives in the marketplace as a result of such things as intellectual capital, culture, and leadership quality as well as customer and labor relationships. Alignment of the workforce with the business strategy, customer requirements and unit. What Factors Underlie People Equity? Alignment is the extent to which employees (or other labor sources) are connected to the business strategy. It includes employees’ alignment with the business strategy, with customers and with the brand identification, in addition to simply focusing on their department or personal goals. Capabilities is the extent to which the organization effectively creates competencies, information, and resources to grow customer value. Engagement goes beyond employee satisfaction with or commitment to one’s job or organization. It includes the level of advocacy on the part of employees for their organizations as great places to work, purchase from, and even invest in. Organizations with higher People Equity scores were almost twice as likely to be at the top of their industry in financial performance. If an organization is in the top quartile on People Equity, it will have an 80% chance of being in the top third of its industry in financial performance, compared to only 37% for low People Equity organizations. High People Equity organizations are three times more likely to have higher quality. Organizations in the top quartile on People Equity have a 94% chance of being in the top third of their industry in quality compared to only 32% for those whose employees are in the bottom quartile on People Equity. In a second study with the American Society of Quality with over 1200 respondents conducted by Seibert and Lingle, the researchers found that People Equity was also an important driver of internal customer service among more than 12 different functions that serve other internal stakeholders. Functions such as IT, HR, Finance, Manufacturing, Law, and Procurement, among others, that had employees with higher Alignment, Capabilities, and Engagement scores received significantly better value ratings from their internal customers. A strong service culture is associated with good internal service; no surprise there. But when combined with a high level of People Equity, the results were dramatic: nearly 70% of such companies got the top internal service ratings. On the other hand, a strong service culture is not enough if People Equity is low. Only 26% of companies with a strong service culture, but low People Equity, achieved the top ratings – powerful evidence of the unique contribution People Equity makes. This should bring us to an inescapable conclusion that People Equity and its constituents — Alignment, Capabilities, and Engagement — is a critical link in the value chain for any organization in which people play a key role in its overall value delivery. The best way to start increasing People Equity is to understand your current organizational profile and begin directing resources to high-leverage areas most likely to improve it. 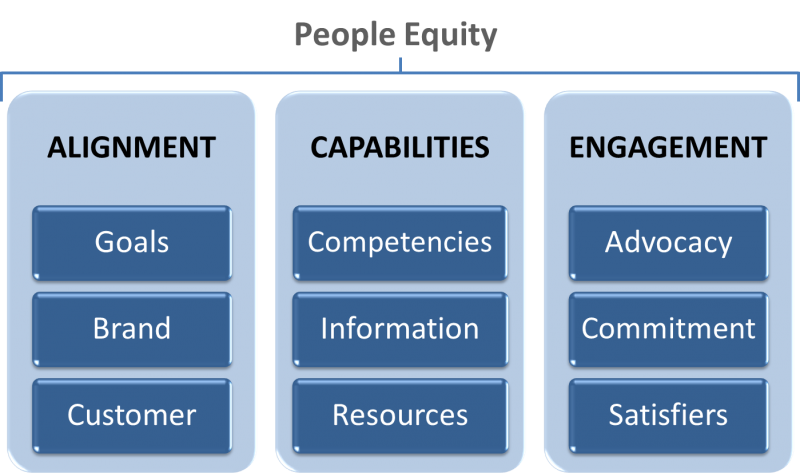 Do you have effective measures in place for all three elements of People Equity: Alignment, Capabilities, and Engagement? If you are using an employee survey, ask whether it captures the strategic elements of People Equity? If not, you need to re-evaluate the purpose of your survey. 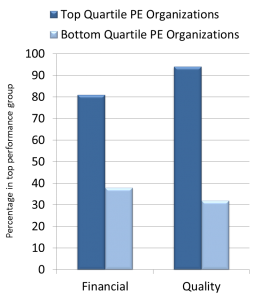 Are senior executives eager to see and use their employee survey results? If not, they do not see how it helps them achieve their goals. Consider including the major Drivers and Enablers of People Equity in your survey. This enables more pinpoint identification of potential root causes for low Alignment, Capabilities, or Engagement.